When The Sing-Off premiered in 2009, it was a one-week special event that crowned a champion out of eight groups in only four episodes. The second season expanded to ten groups and five episodes over two weeks. Tonight’s third season premiere shifts the show into a 11-episode competition, airing once a week, with 16 groups. Now that Glee has skyrocketed, American Idol and The X Factor will duke it out for reality competition supremacy, and The Voice crowds the already hectic talent-based reality show programming on the same network, does a retooled and reorganized version of The Sing-Off stand a better chance? With nothing more than a whimper, The Sing-Off responds to that question with some slight improvements that don’t really fix the overall weakness of the show. It’s still mind-boggling just how much NBC is wasting another golden opportunity, unable to work the kinks out of a reality competition in its third season to take full advantage of the a cappella audience. The biggest inherent problem with The Sing-Off remains its bracket format, arbitrarily dividing the 16 groups in half, then into four pods of four groups. Only eight groups competed tonight, with one group from each of the two pods being eliminated through a decision by the judges. Confusing enough? Exactly. To make matters worse, none of the eight groups that performed during a two-hour premiere had the sizzling debut that previous winners Nota and Committed made in the past two seasons. None of these groups delivered a performance that demanded attention or notice, the best only achieving above-average marks. The bracketology is completely hidden, so no one watching has any idea how these matchups were thrown together. Knowing the selection process of The Sing-Off from some inside sources who auditioned, groups from across the country tried out, then NBC sent a large amount of them offers, and then chose these 16 from those that submitted signed contracts. That’s how we end up with a group like Urban Method from Denver, who have the show’s first display of “Rap-appella,” as Ben Folds refers to it. Their angle is obvious from Nick Lachey’s lead-up to the intro video: they want to be edgy, and then they literally describe themselves as edgy. They reference that Denver is such a strange place to have a rapper in an a cappella group, ignoring the idea that there is no proper place for an a cappella group with an MC. All-female groups have had a rough go on the show because, as Lachey notes in surprisingly astute fashion, they typically don’t have any voices to fill out the bottom end of the vocal range and end up sounding imbalanced or slightly empty. Delilah was a bit of a nice surprise then, with the fullest sound an all-female group has given on the show, even if many of the members had performed in losing groups from the past two seasons, adding the element of experience in the spotlight that rang as more than a bit unfair. 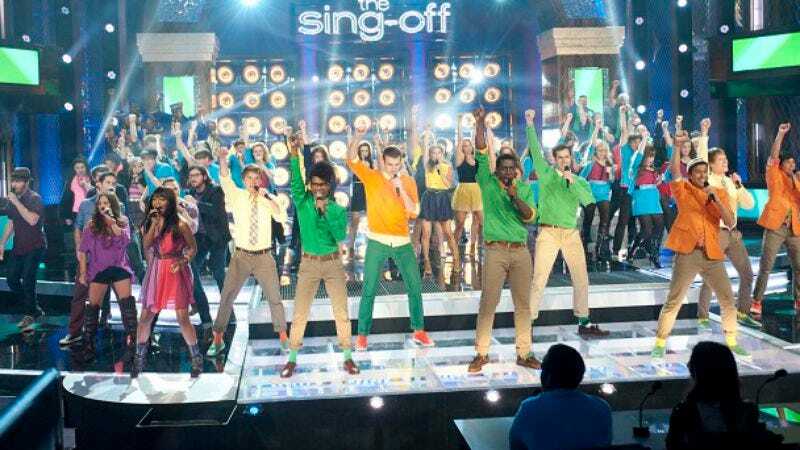 If the groups best-designed to win a competition like The Sing-Off are best-of collectives formed from various groups and solo singers, then hasn’t the show essentially turned its back on the niche of college a cappella that forms the base of the competition? The first season featured the Beelzebubs from Tufts University, a niche-popular group that sang backing vocals for Darren Criss and the Warblers on Glee, while the second season had the Yale Whiffenpoofs, who despite a horrendous name hold the distinction of being the original college a cappella group. This time around, the stereotypical jazzed-up college group is the University of Rochester’s YellowJackets. They fit the bill just fine: requisite yellow blazers and annoyingly chipper attitude, but now, it just feels like the show is filling a requisite roster spot. BYU’s Vocal Point keep up the religious angle, Fannin Family merits a Partridge Family or Von Trapp shout out, but again, nobody separated themselves as a favorite, and that’s a big problem when The Sing-Off is trying to hook viewers in for a longer season airing in a traditional weekly fashion. Former Pussycat Doll Nicole Scherzinger left the show to join The X Factor, which gave The Sing-Off a chance to replace her with someone more in line with the niche it cultivates, but Sara Bareilles turned out to only be half of a good choice. Her big hit “Love Song” is already a college a cappella staple—the all-female group at my alma mater had it in its repertoire—and she had some genuinely funny moments, but she was the judge most prone to getting bogged down in a group’s backstory instead of their singing. The judges are there to make a decision out of context, based on technical ability and showmanship, not comment on the intro videos. Time and time again, Bareilles brought up something from an introductory video instead of making a comment on the actual performance, and it was just plain distracting. Ben Folds and Shawn Stockman are still mediocre at best, and the show still suffers from being overly complimentary without having any actual analysis of the groups. At one point, Folds almost became the show’s Simon Cowell, but now he’s just as frustrating as the other judges, doling out compliments with tepid critiques. The most egregious example came during Howard University’s Afro-Blue, a jazz choir that combines that genre with R&B and Funk but noticeably doesn’t cite Soul, which was completely absent from its technically fine but empty performance of Corinne Bailey Rae’s “Put Your Records On” that still got bafflingly positive feedback from the judges. On Glee, the best moments of the quality rollercoaster come when the inherent sadness of Lima, Ohio moves front and center. In a similar way, the best parts of The Sing-Off display the different facets of trying to make it as a singer. Cat’s Pajamas are a group of consummate professionals who worked on cruise ships and settled in Missouri to perform 200 shows a year. They’re technically gifted, but there’s a reason those guys are in Missouri instead of on Broadway or a touring production of Jersey Boys: They just don’t have the emotional power to back up the impressive vocal talent. Kinfolk 9 have the struggling artist bent, while the college groups have amateur and music school backgrounds. Upcoming performers on next week’s show even include another group made up entirely of high school students. The benefit of the old Sing-Off format was that it kept viewers engaged for a very short period of time after most shows had already gone on a winter hiatus in December. Now that the show has to compete for attention with a fall slate of reality programming and bring back viewers week after week, this premiere doesn’t inspire confidence that The Sing-Off has enough talent or a compelling enough hook to be more than a week-long special. Hey everyone, I’m Kevin McFarland, one of the newest additions to the TV Club lineup. I went to Northwestern University in Evanston, where I had a fair amount of friends in the vibrant and sometimes cutthroat a cappella community. I’d recommend checking out Pitch Perfect by Mickey Rapkin, which gives a great in-depth look at the rise of the college a cappella subgenre that directly contributed to this show making it on the air. Love him or hate him, Nick Lachey has a really nice rapport with the judges. The shtick at the beginning where he talked to the judges after introducing them was stilted, but over the course of the night, they loosened up. At least it was better than the wooden, uncomfortable back-and-forth Ryan Seacrest has with the Idol judges. While my opinions were completely in line with the judges—I guessed correctly before the eliminations that Fannin Family and Cat’s Pajamas would be gone— I struggle to believe that the voting audience of America would have made the same choices. For some reason, I feel like Kinfolk 9 and the YellowJackets got lucky that votes from the heartland weren’t involved. Kinfolk 9 sang “Hallelujah” during their intro video. I’m just plain done hearing covers of that song. After the miserable version by the Canadian Tenors on the Emmys, Leonard Cohen doesn’t need another overwrought cover of his work. Both times during the elimination segment, the groups on the outer left and right made it through to the next round, so it kind of clued everyone in on which two groups would be in the last artificially suspenseful moment. Keep that in mind if you watch next week.